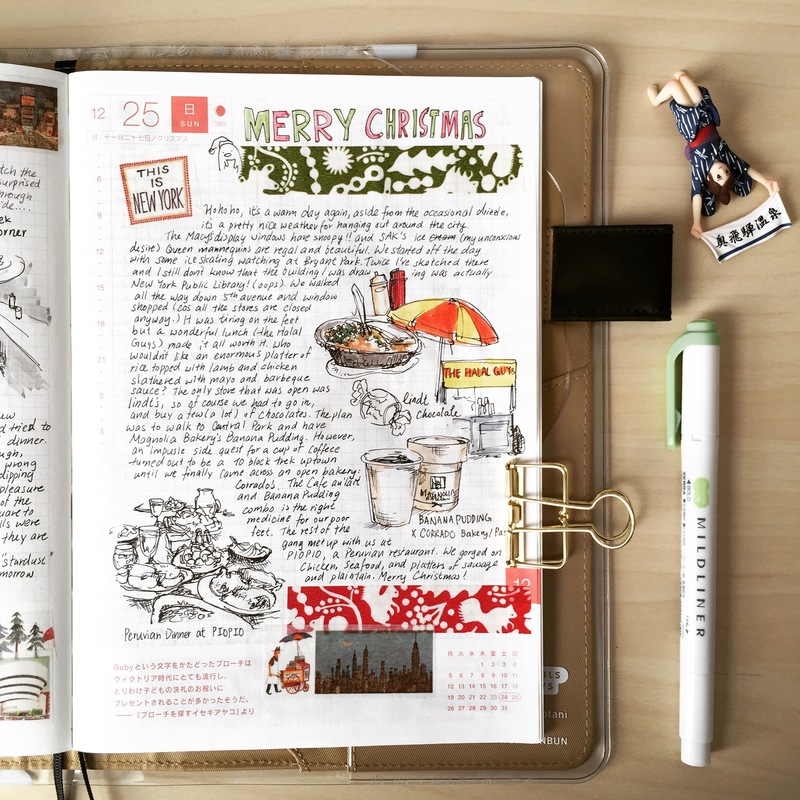 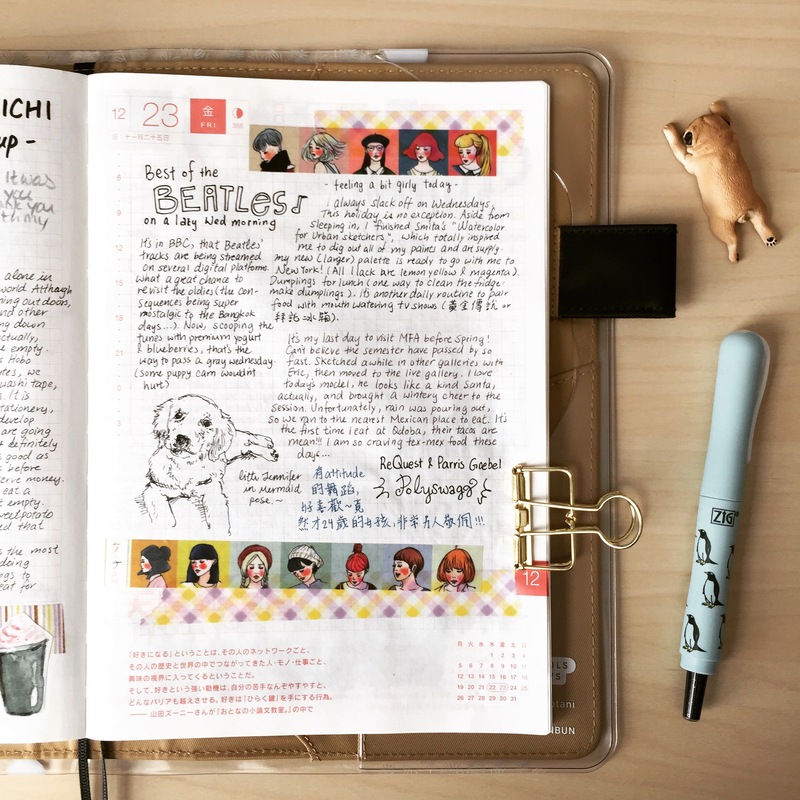 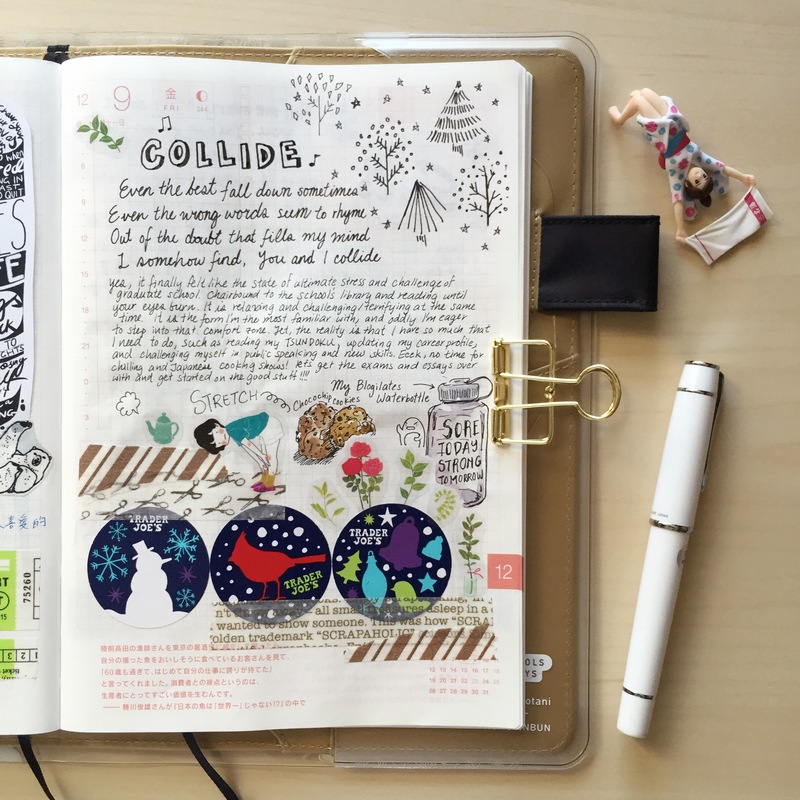 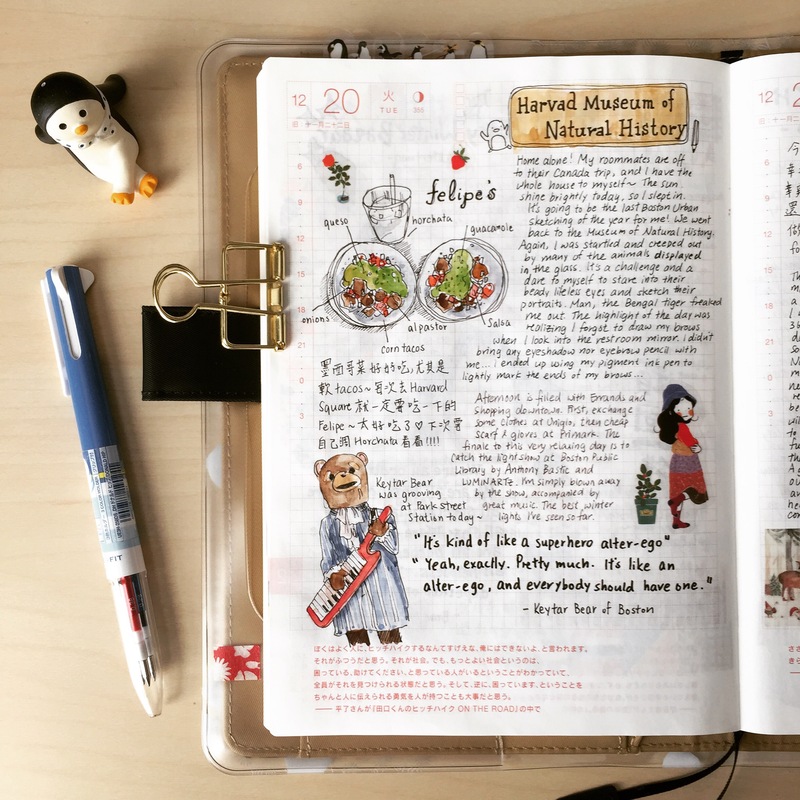 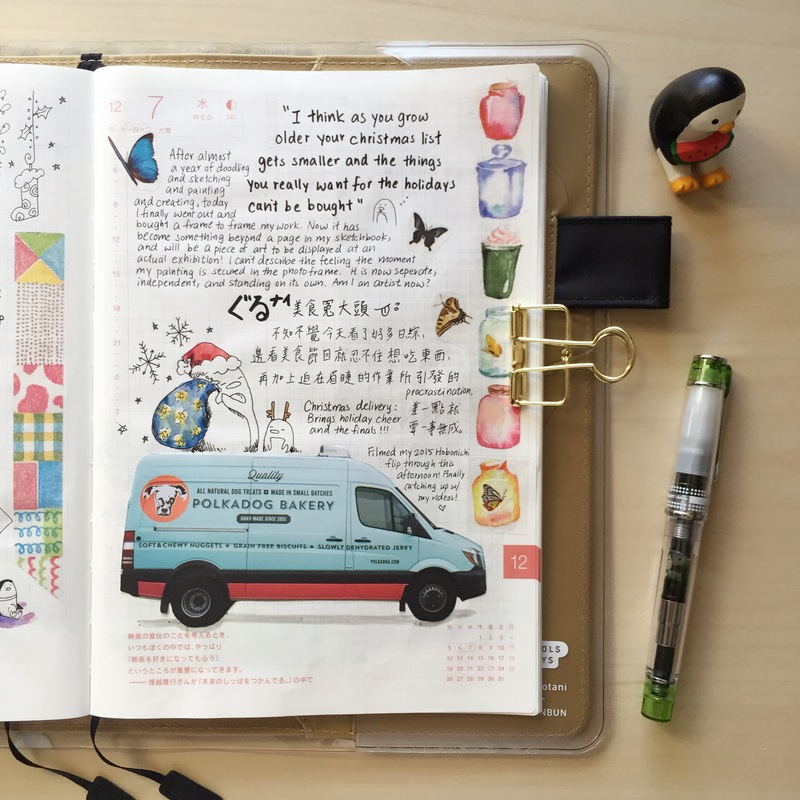 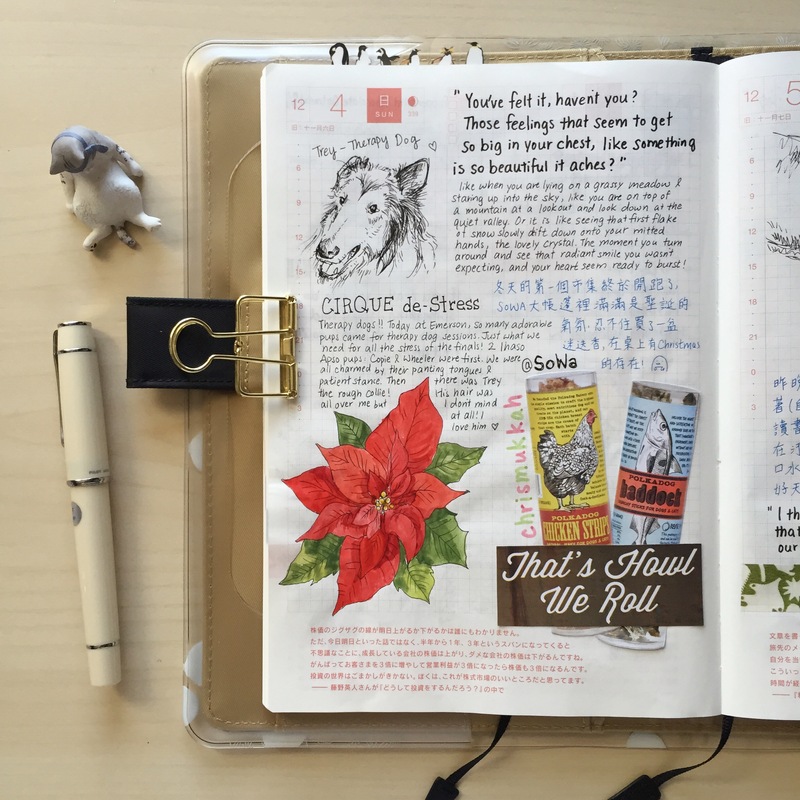 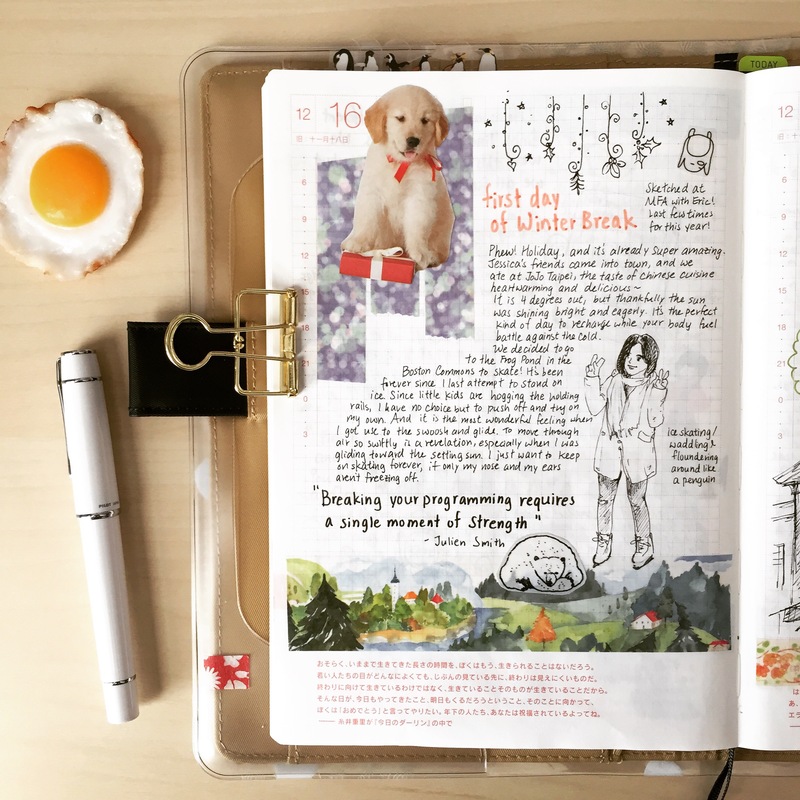 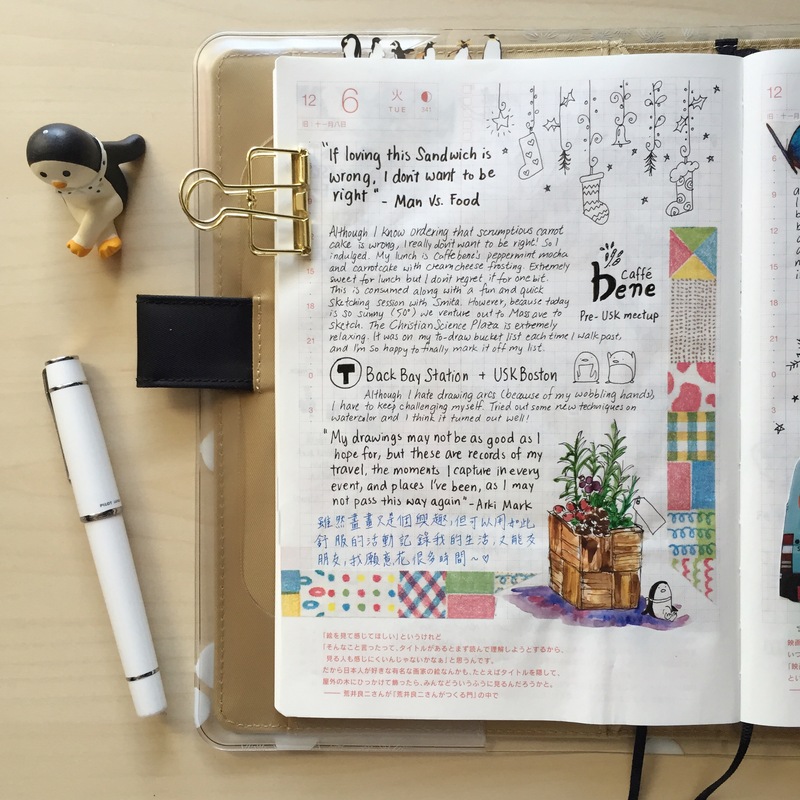 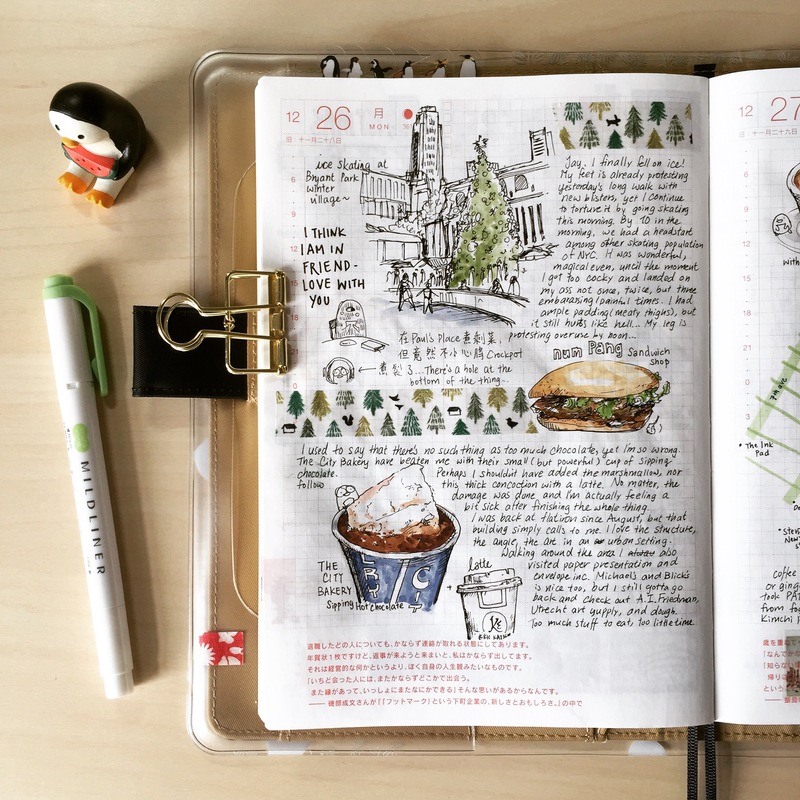 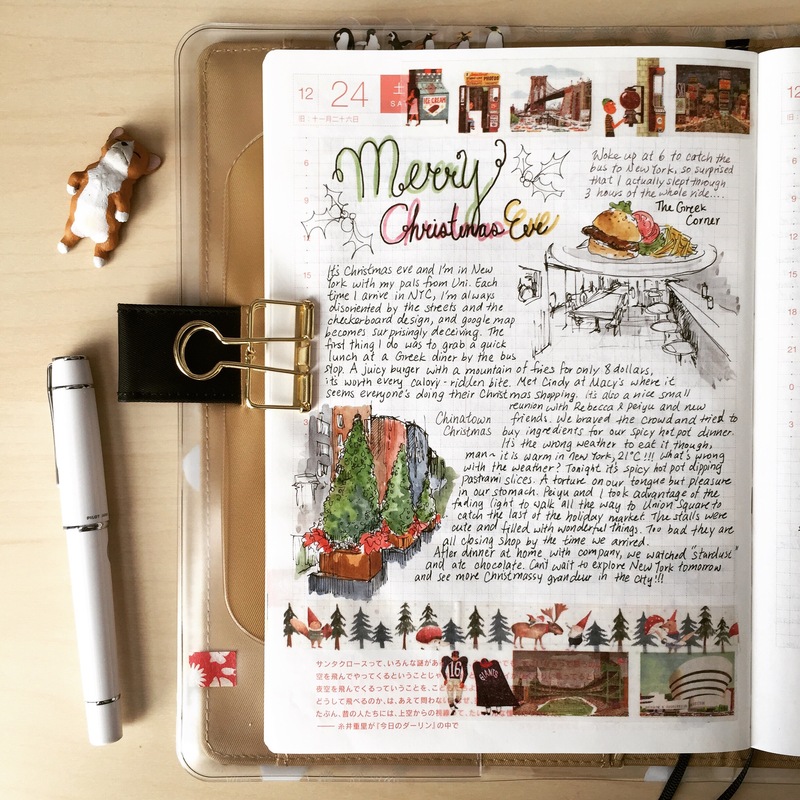 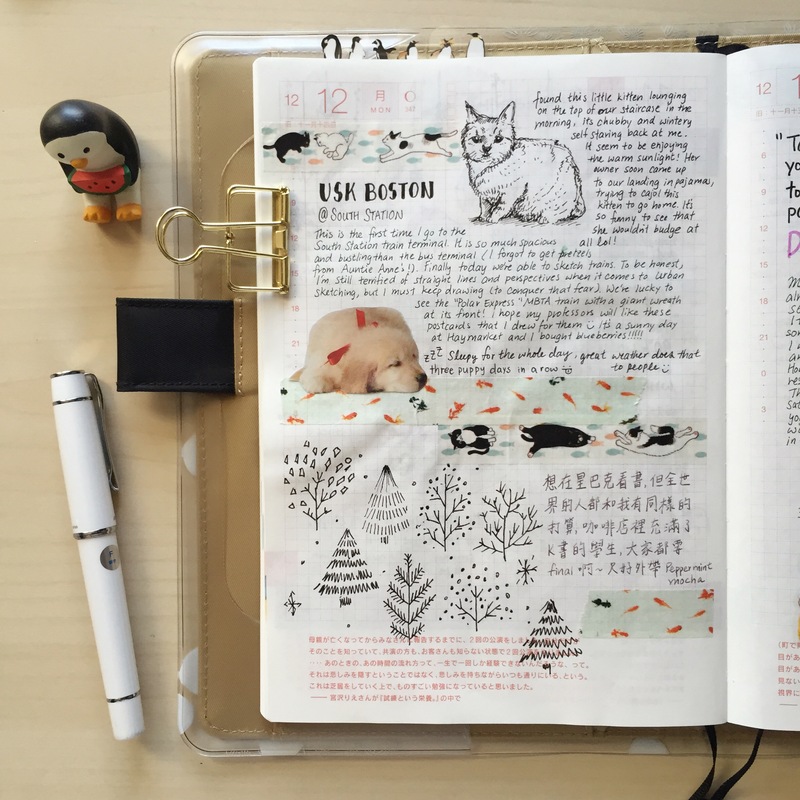 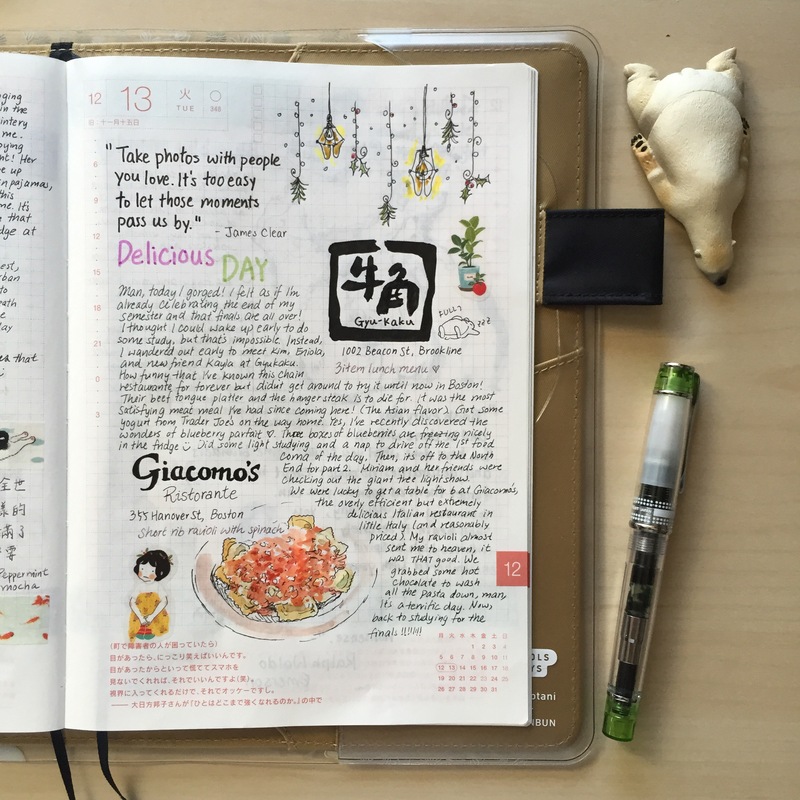 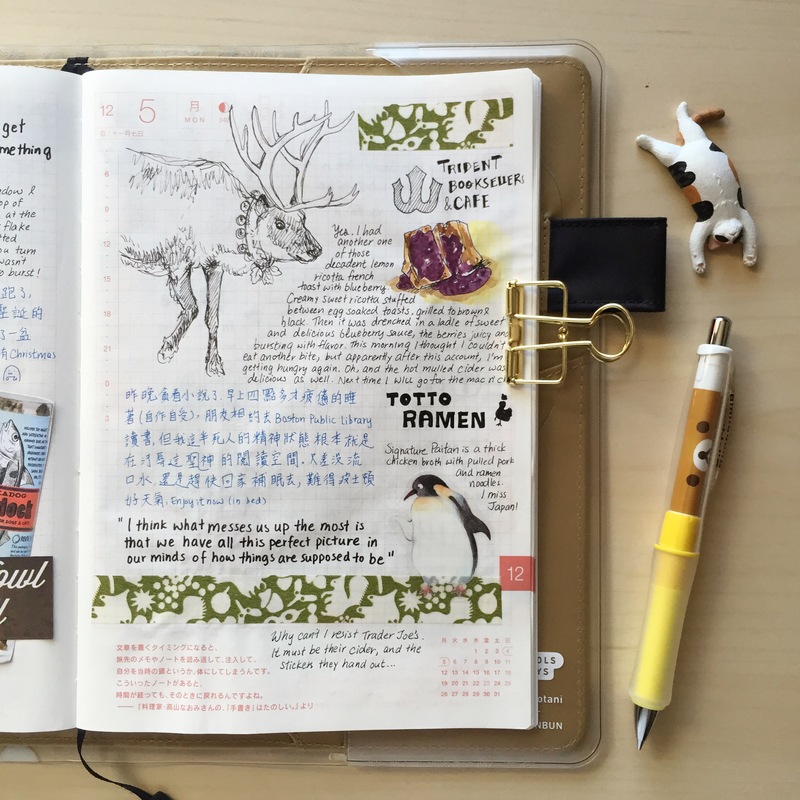 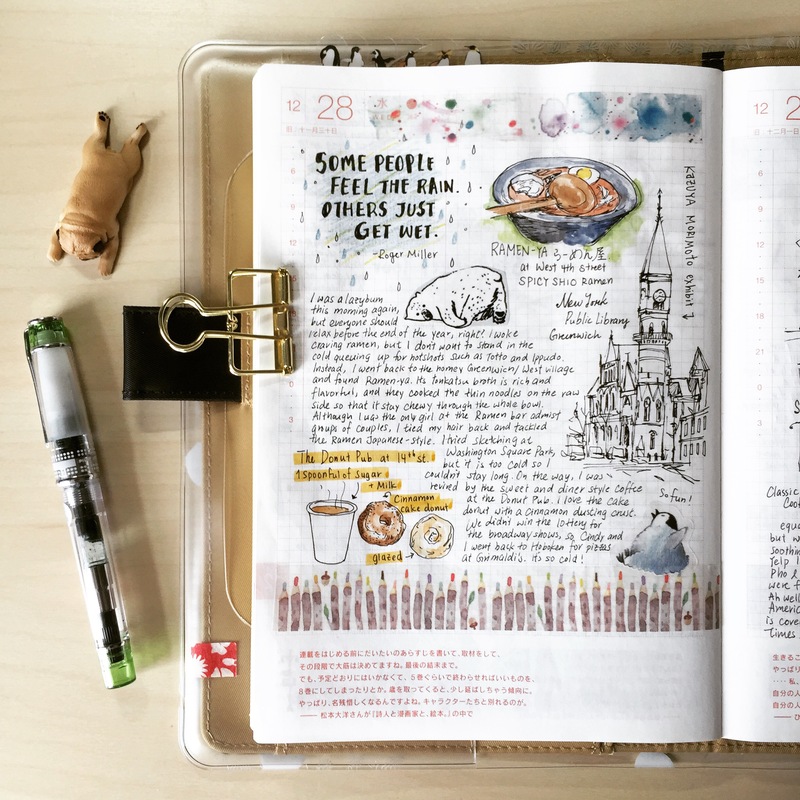 Here’s a review of my first month in the Hobonichi A5 Cousin! 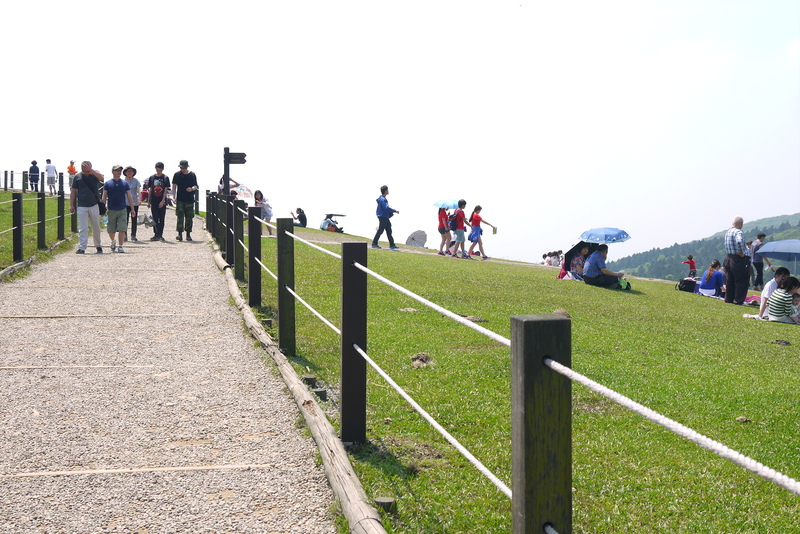 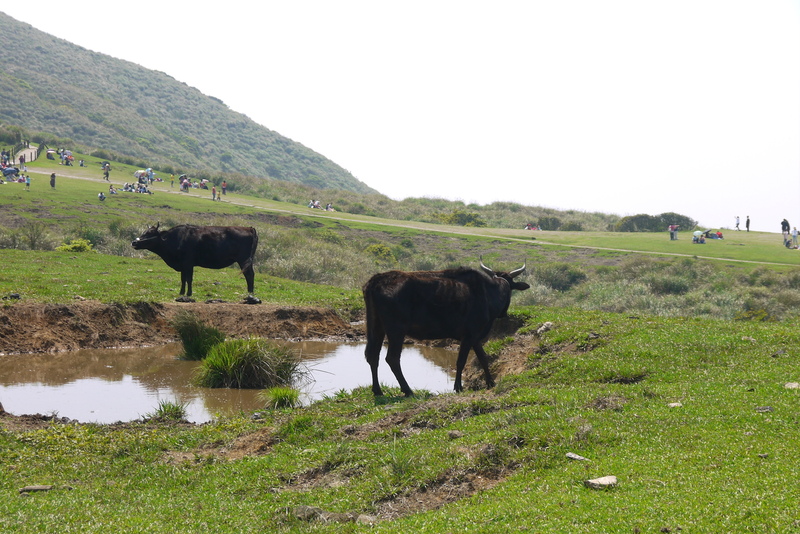 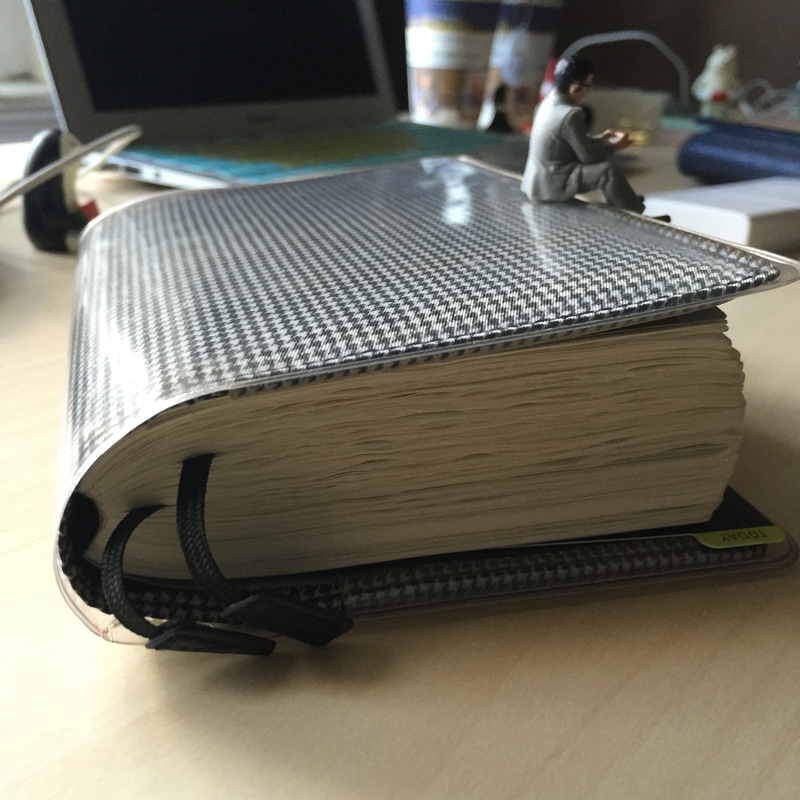 我很喜歡Unmistakable Creative他們所提出的 15 principles for living a creative life. 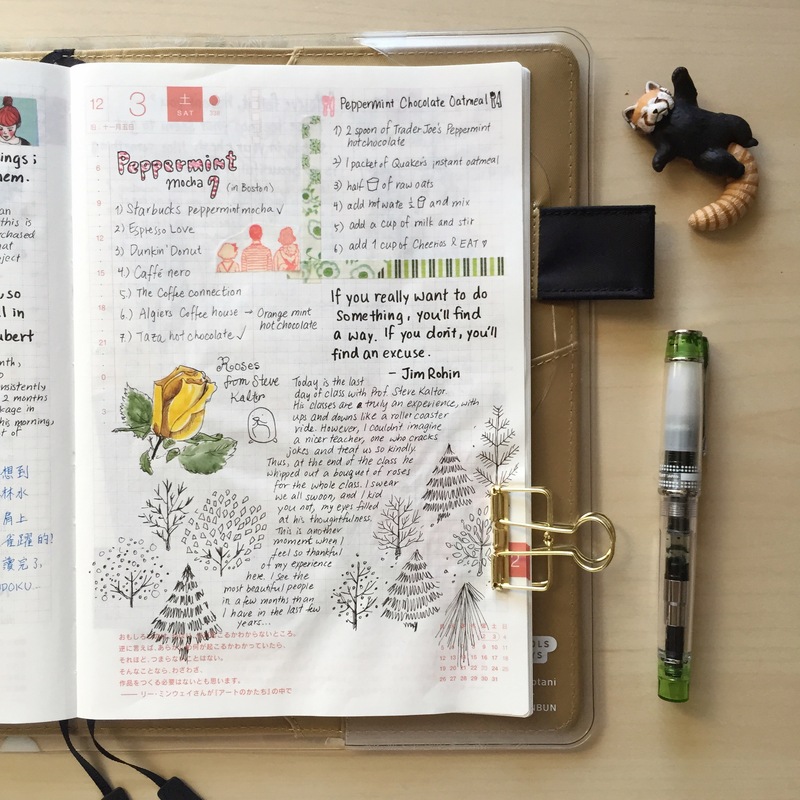 其中三項真的很貼切: It’s about showing up when you don’t feel like it. 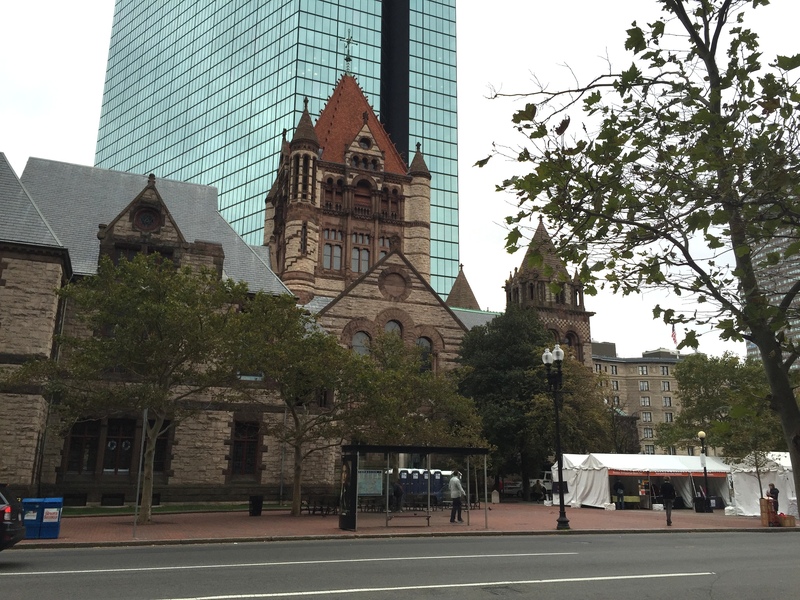 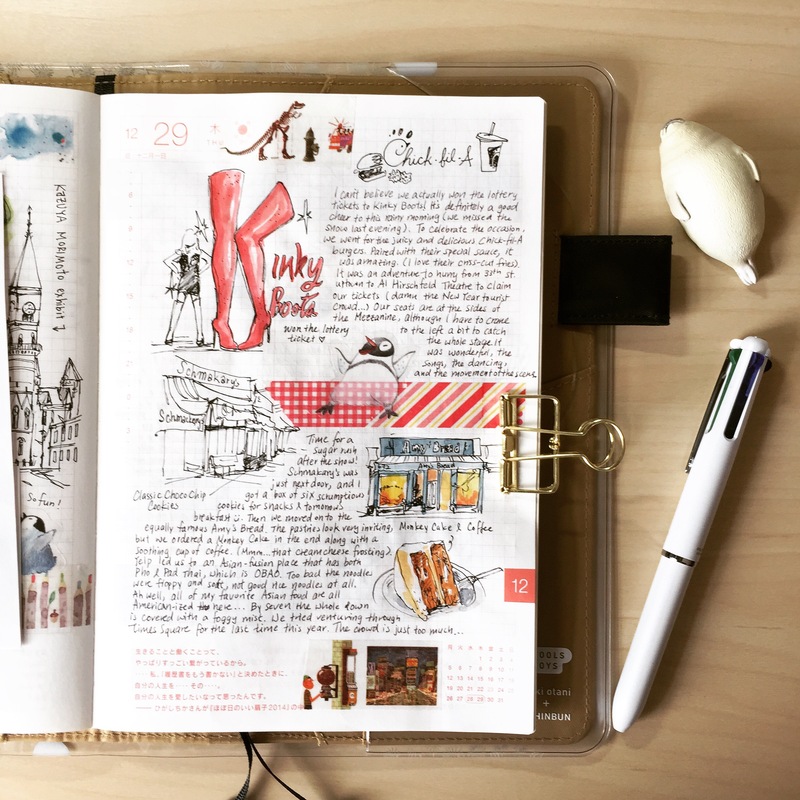 It’s about showing up when you’re uninspired. 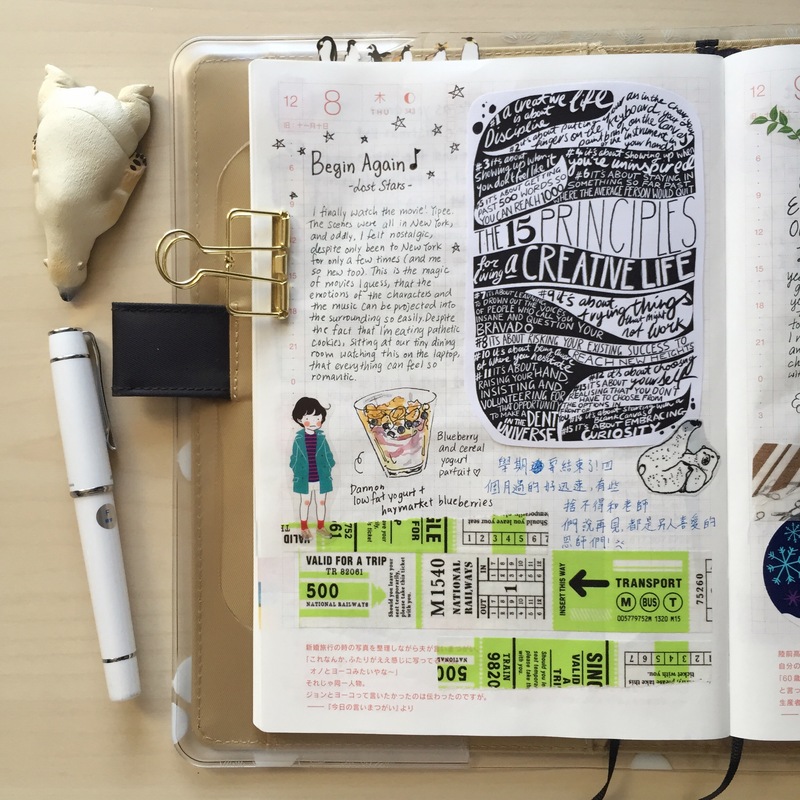 It’s about staying in something so far past where the average person would quit. 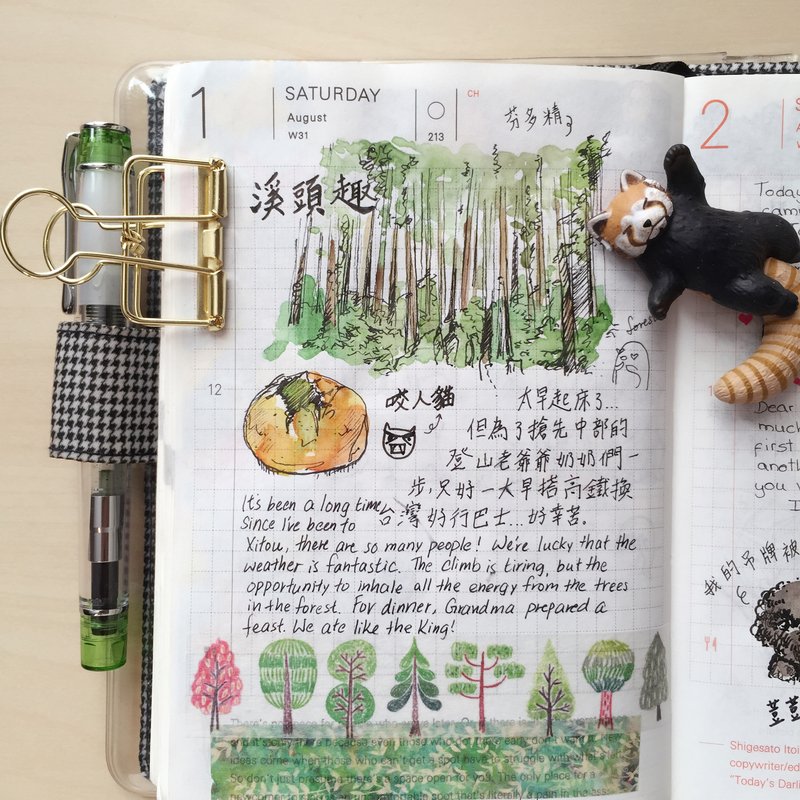 很多時候容易覺得這件事很煩躁就放棄他，雖然他們都是達成目標所必經的過程! 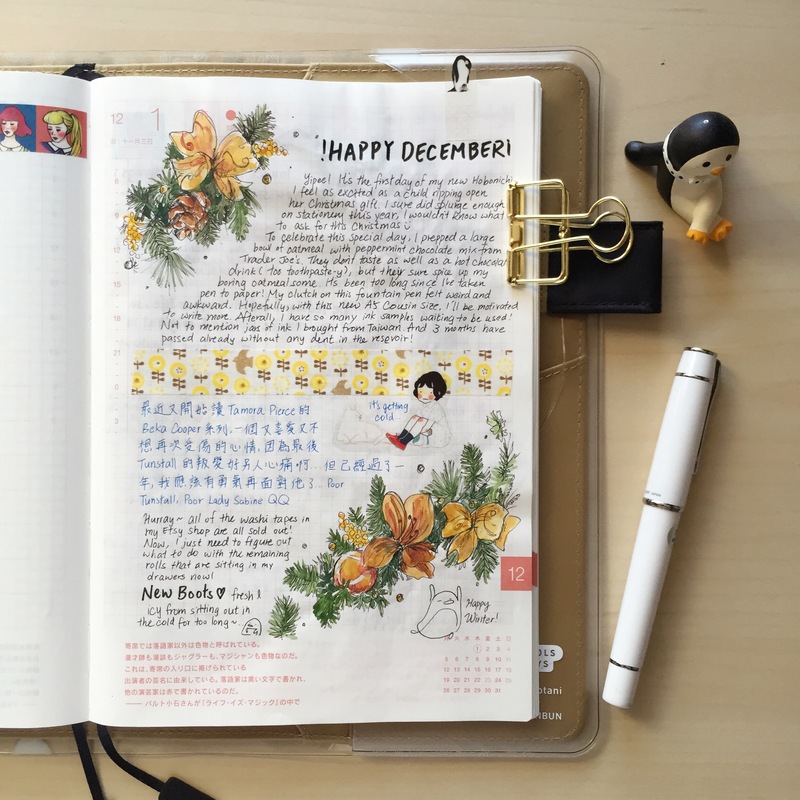 天阿～新年快樂！2015就這樣結束了! 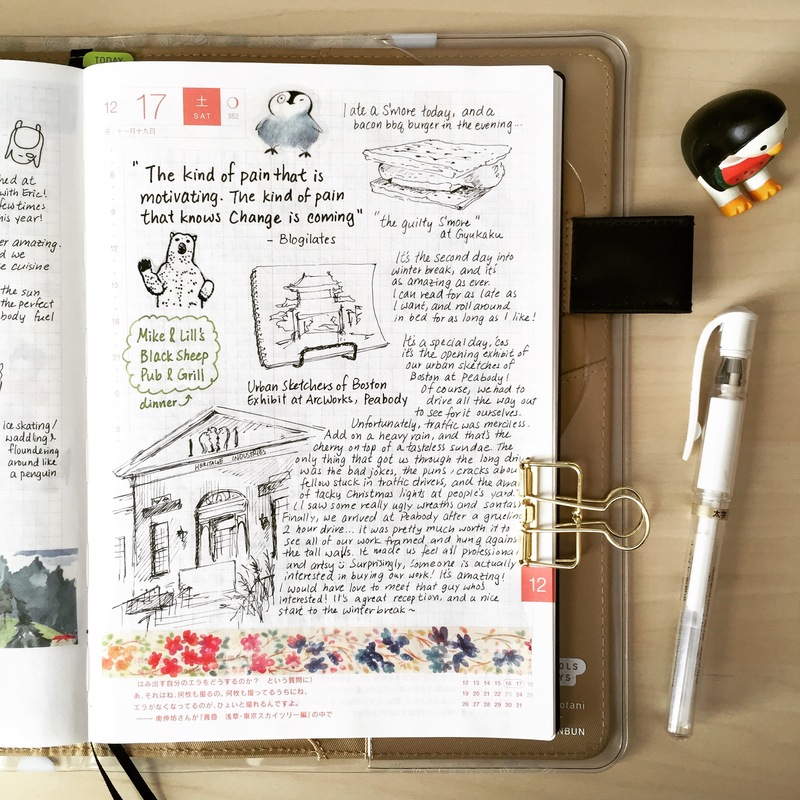 畫下完美句點的那一刻我們正在Mckittrick Hotel與Sleep No More的劇組在舞池裡狂歡! 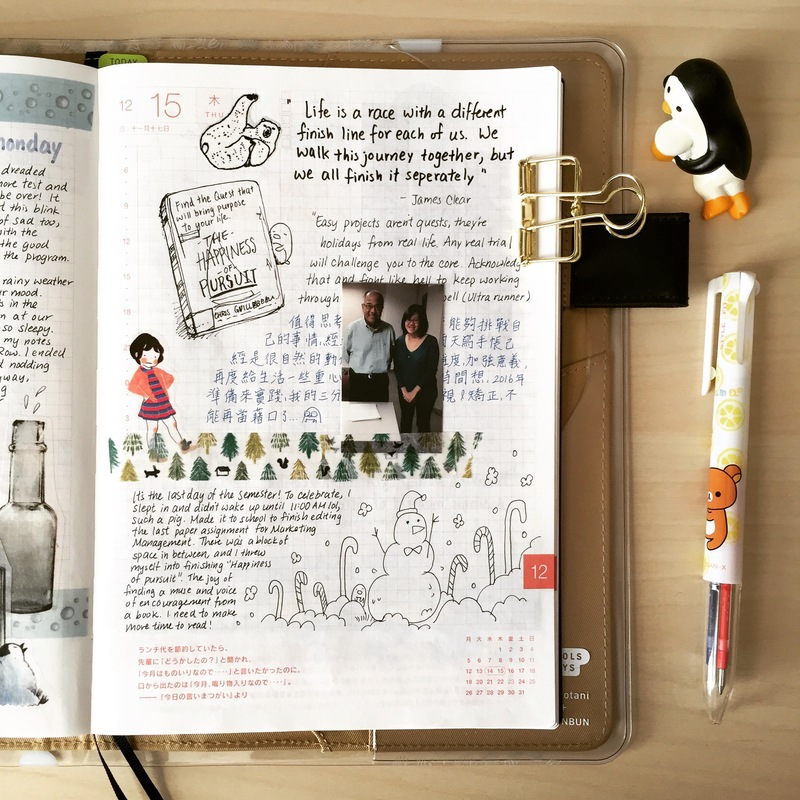 I can’t believe that year 2015 is almost three quarters over! 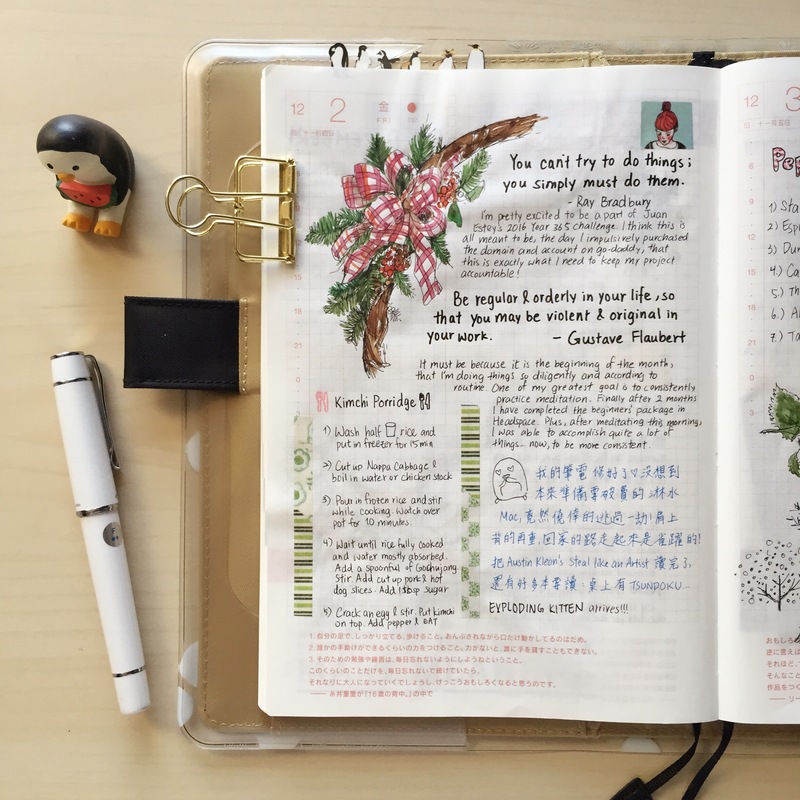 Looking at the picture of my Hobonichi Chunk, I can barely see the sliver of pages that are blank and waiting to be filled up. 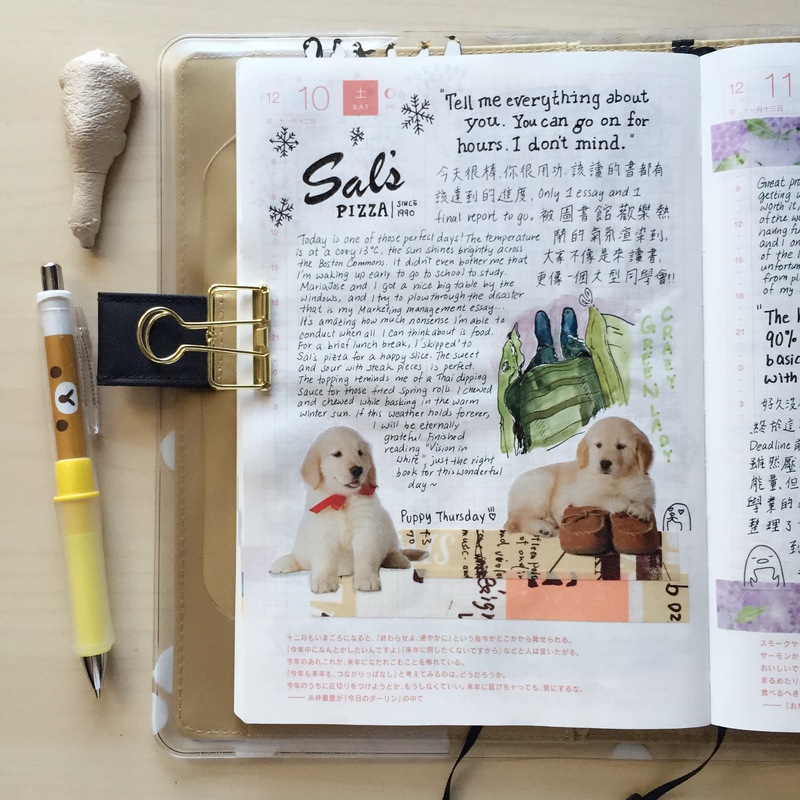 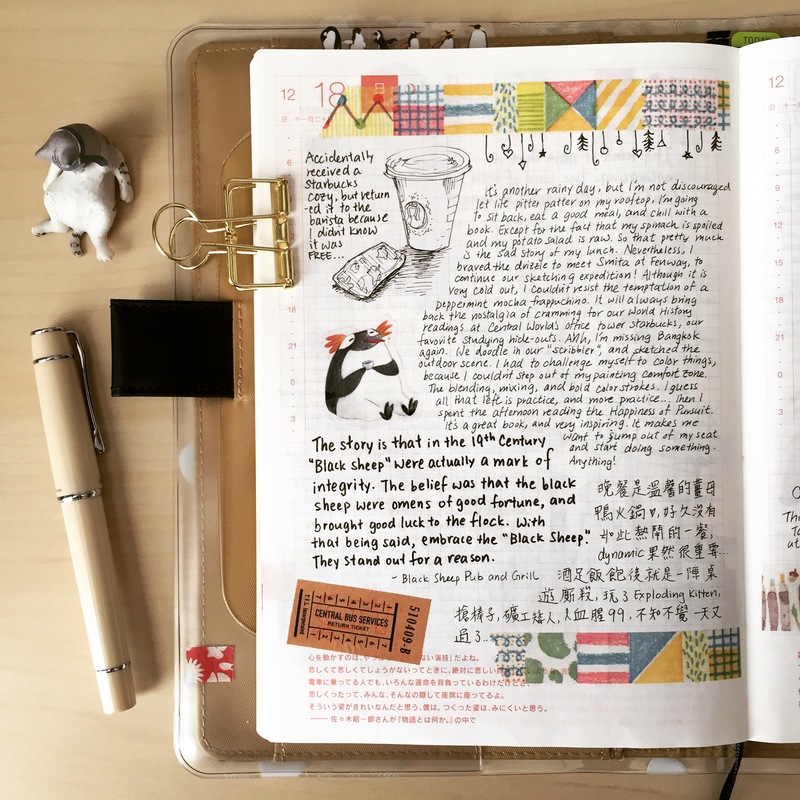 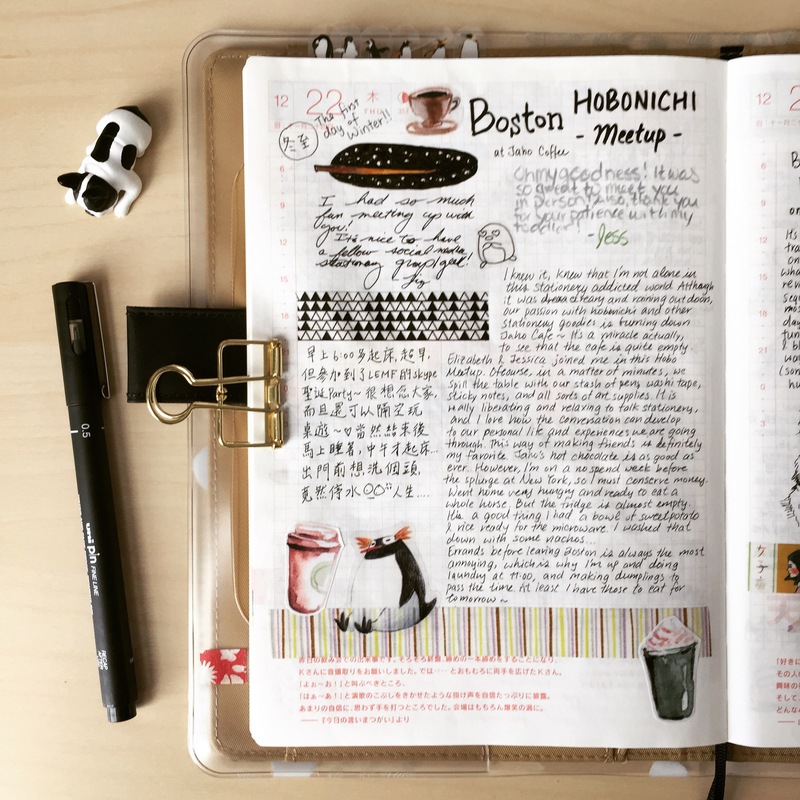 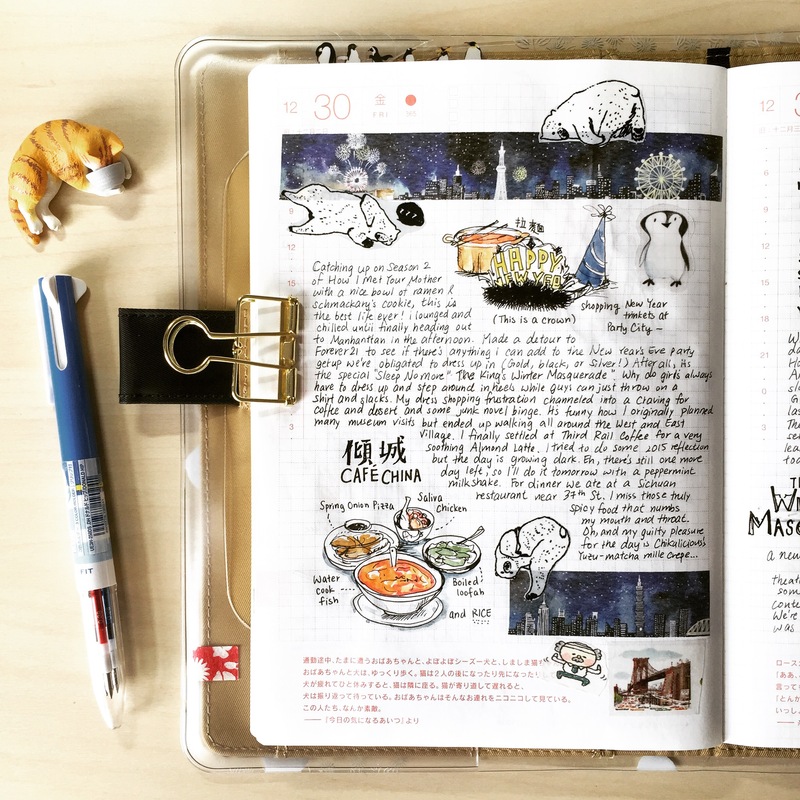 I would like to thank the Hobonichi User community on Facebook that had inspired me to start writing in a Hobonichi journal again, and what a wonderful journey. 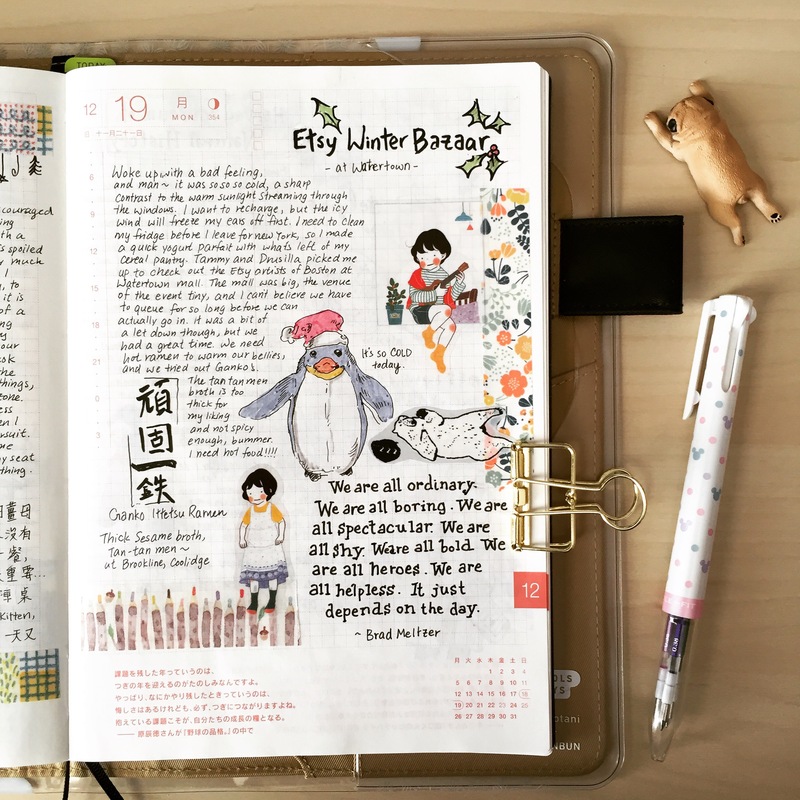 I started out humbly in my English planner with diary entries, and gradually had courage to paint in water-colour, draw sketches and lots of doodling, and finally incorporating washi tape and stickers to create the style that is @Penguinscreative today. 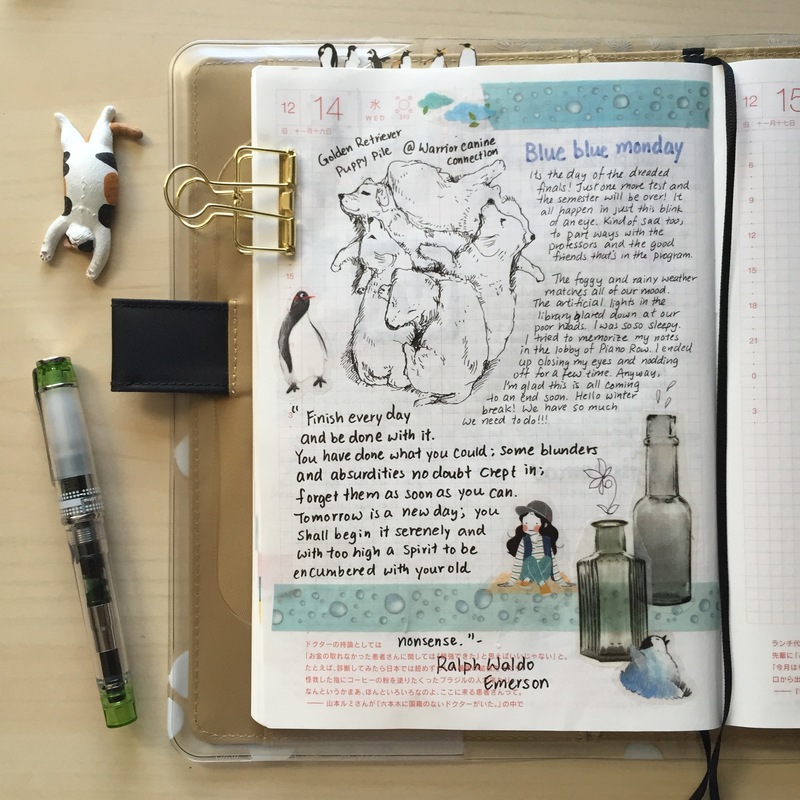 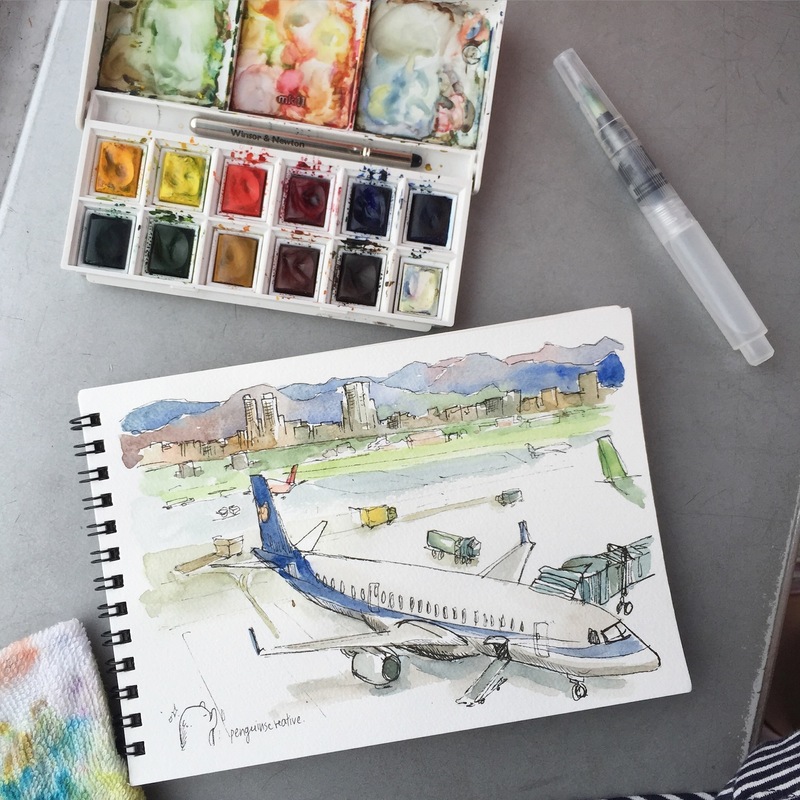 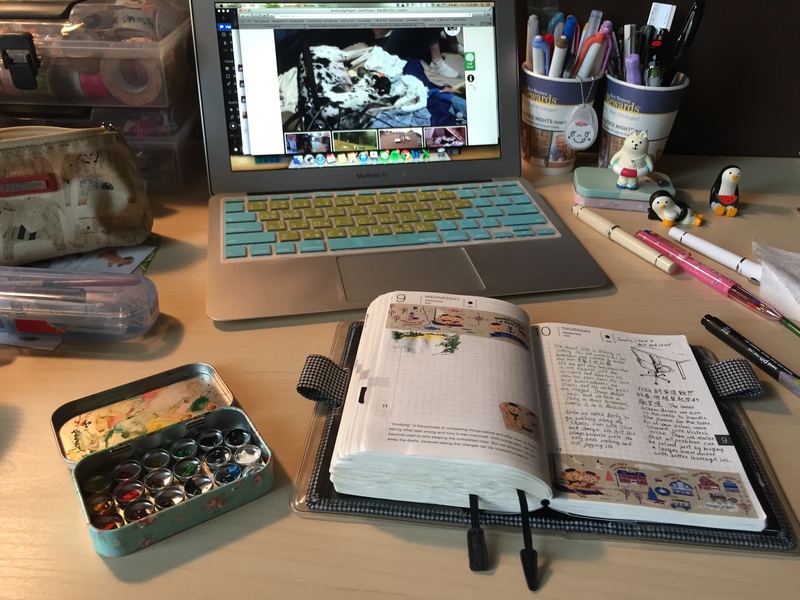 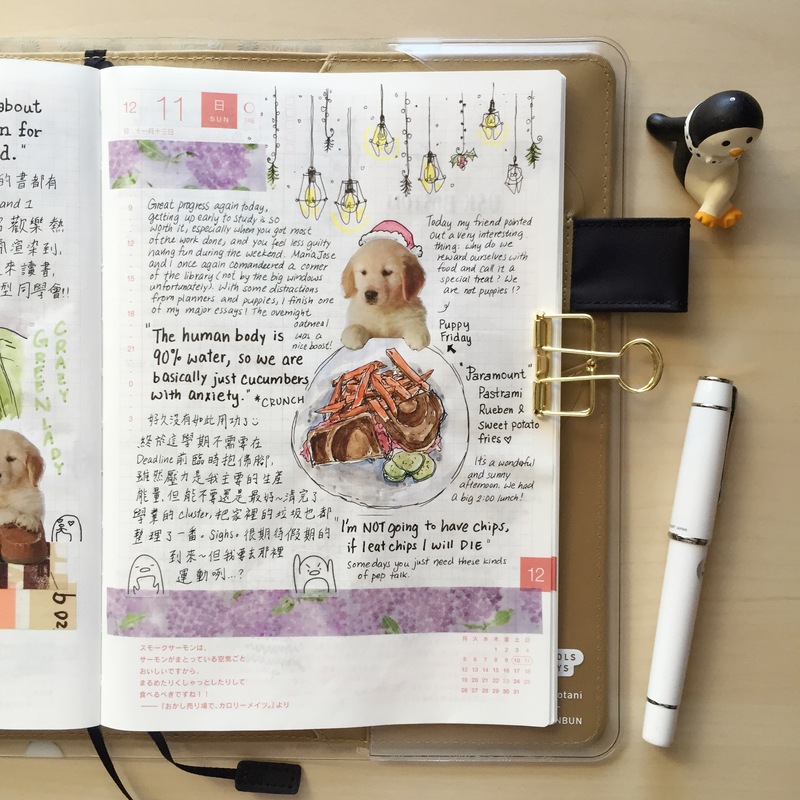 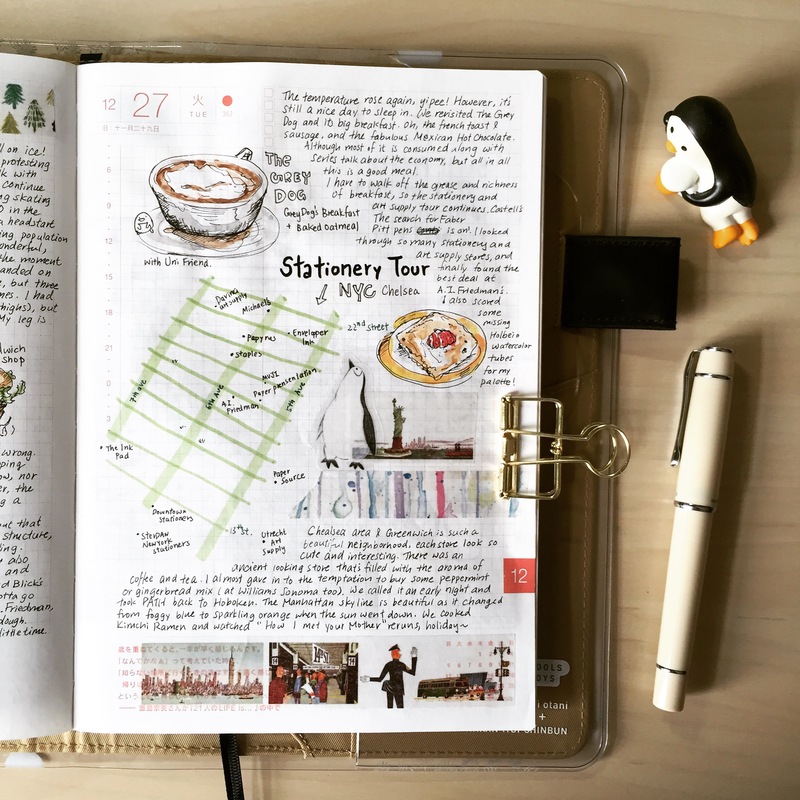 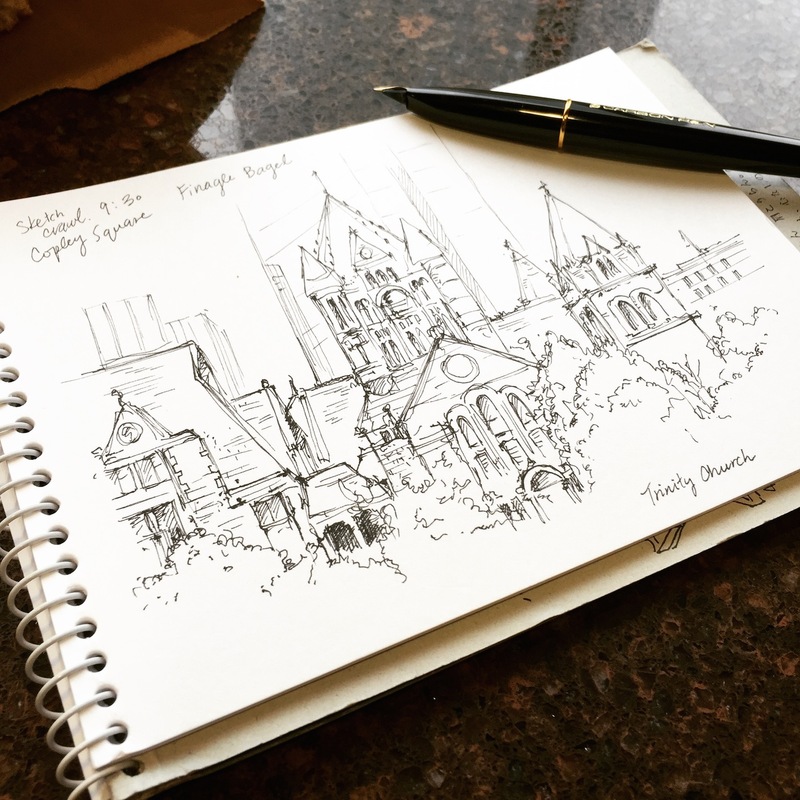 On April 25th, a few of us planner addicts got together to a Planner Meet-up, where we share our planner usages and materials we use to decorate daily pages. 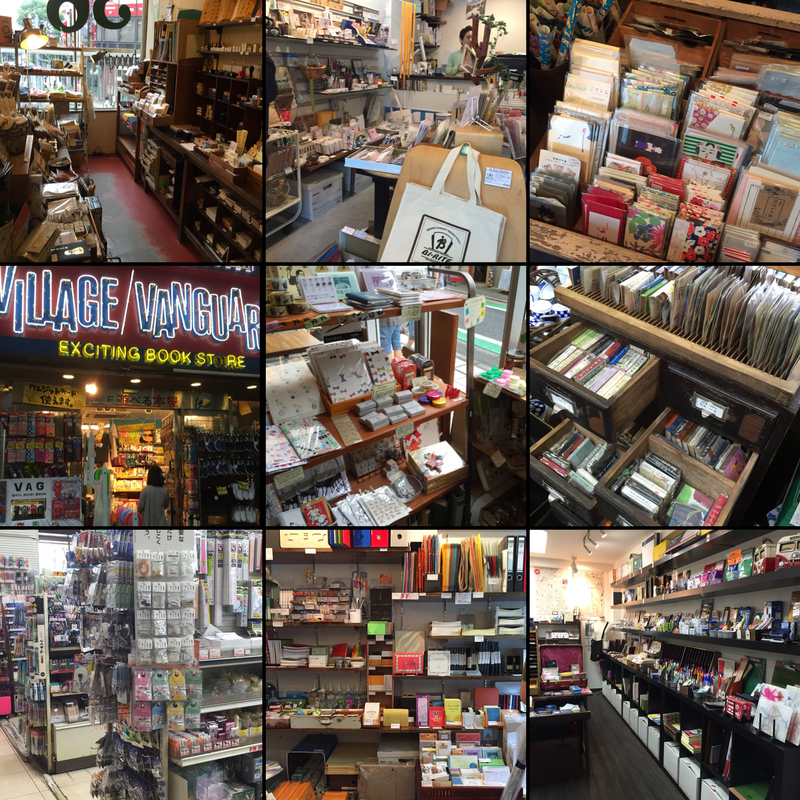 After the event, a few of us decide to continue the stationery-high we were in, and check out a famous fountain-pen boutique in Taipei: 小品雅集, and a cozy stationery store tucked inside a discreet alley: Vision Stationery. 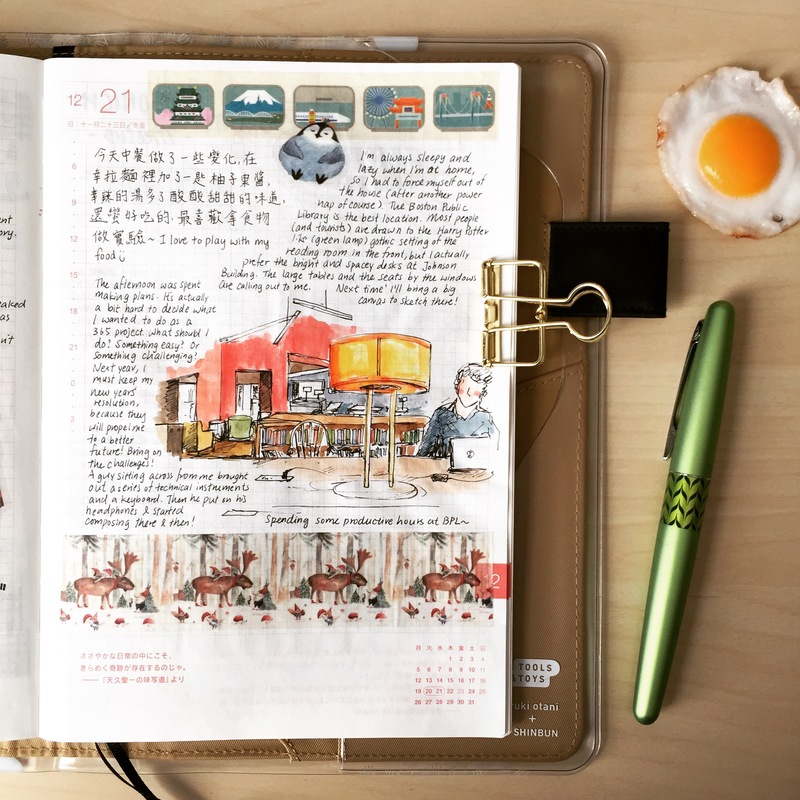 小品雅集 ‘s owner is a fountain-pen lover and collector. 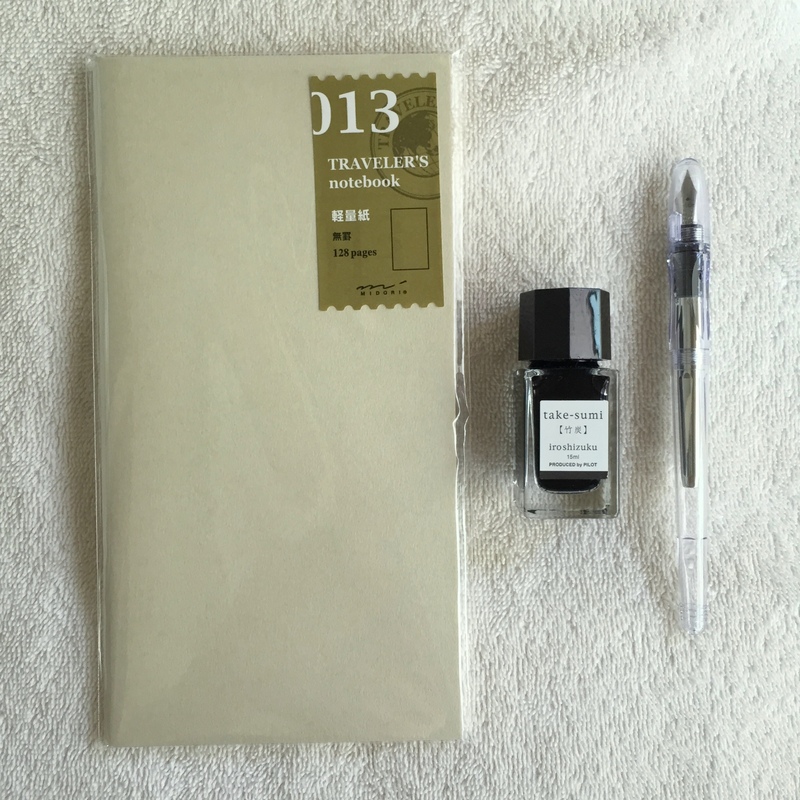 He imported a variety of inks and fountain pens from all over the world, and sell them at very fair prices in his boutique. 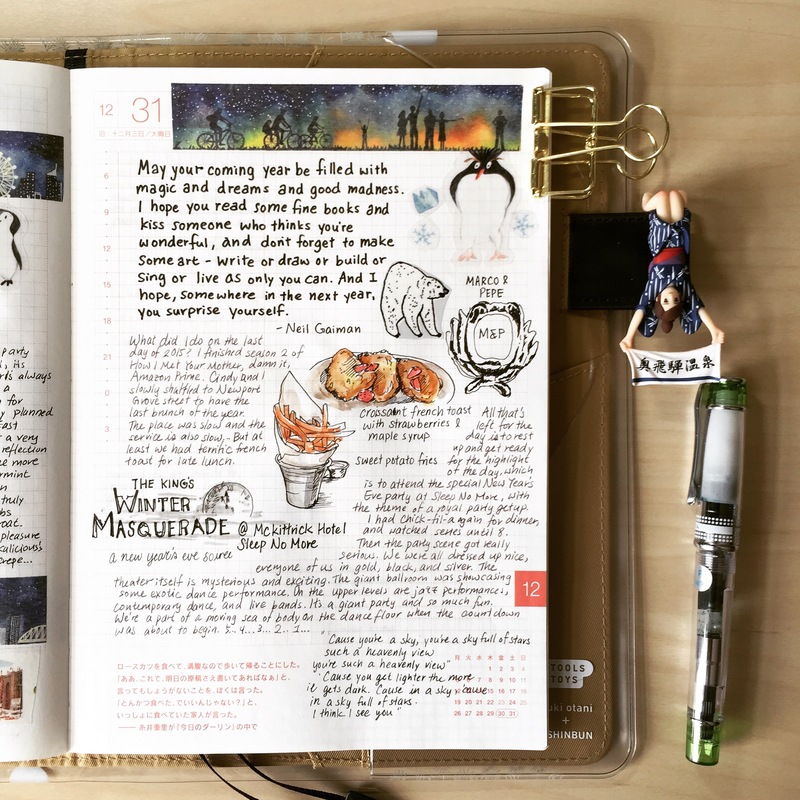 The collection of fountain pen range from beginner brands (Pilot Kakunos, Sailor Candy) to more costly and high-end products (Montblanc, limited edition Graf Von Faber-Castell).